These are the requirements students must fulfill to pass my class on British Literature, 1660-1740. Of course, they’re also required to keep up with the schedule of readings. Walking across campus this evening at around 7:00, I noticed the chalk markings on the sidewalks for the first time. Temporary epitaphs like We will never forget and God’s way is peace, not war and Kill Bin Laden. “Love is Lighter Than Air,” by Magnetic Fields. Last summer. 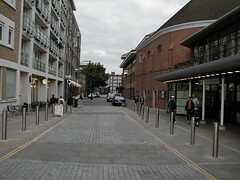 On the left, a Starbucks. On the right, the Globe Theatre. I know it’s not the original location of the Globe (apparently a brewery stands on that site today), but I was struck by how many Starbucks were in London, and this picture seemed the perfect embodiment of that fact. …and they want their culture wars back. Meanwhile, a very interesting thread called “About Reading” is taking place on the listserv sponsored by SHARP.